Jammer's Blog » I compare ‘Curb Your Enthusiasm’ to ‘Star Trek.’ Because I can. I compare ‘Curb Your Enthusiasm’ to ‘Star Trek.’ Because I can. 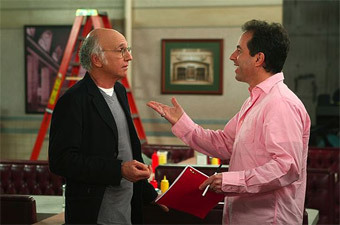 “Larry David” and “Jerry Seinfeld” prepare a “scene” on a “reunion show.” In the show-within-a-show, Larry later decides to play George, who was originally inspired by Larry. Brains explode. As everyone who has watched this season of Curb Your Enthusiasm (and probably many who haven’t) knows, this was the year in which Curb went hyper-meta and became, in part, a show about making a Seinfeld reunion show. The plotline came to a head in last night’s finale, which was brilliant, and in some weird ways played like science fiction. Larry David, who plays a fictional version of himself on the show, spent this season getting the Seinfeld cast back together (with the usual amusements that ensue from setbacks, histrionics, and in-jokes) in order to create a Seinfeld reunion that would serve, in a sense, as a second finale to the series which had that famously disliked final episode. I’m pretty sure Larry David made the universe fold in on itself tonight. More specifically, he made the Curb universe and the Seinfeld universe merge and then fold in on itself — and it was nothing short of incredible to watch. Larry David playing “Larry David” playing George Costanza, aka a fictional Larry David? Could there be a stranger feat for an actor to pull off than playing two fictional versions of himself simultaneously? Yes. Nailed it. To be a nerd and tie it all together, this reminds me of the way the Star Trek universe folded in upon itself in Trek XI by having Spock travel back in time as a literally plotted explanation for rebooting the entire Trek franchise. The paradoxes are fun — all the while, at a story level, the creators are toying with us because they are playing with the fictional “realities” primarily to serve as commentaries on themselves. In the case of Trek, it’s done as a nod that the original series did in fact exist and that a relaunch is done within that existing framework (granted, wiping it out at the same time). With Curb/Seinfeld, it allows a show to do a reunion while sidestepping the typical pitfalls of a reunion show — and to avoid, to a degree, any sense of earnest sincerity, which was always a critical aspect of Seinfeld (that is, avoiding sincerity, not embracing it). Call it food for needless thought. Any Curb/Seinfeld fans out there in JammerLand? (In lieu of calling it something else, I guess that will do. Colbert Nation it ain’t.) What did you think? Not really wiped out. They still want the revenue from the novels, comics, online gamers’ subscriptions using the old version of the Trek continuity, after all. My GF is a HUGE Seinfeld fan but we’d never seen Curb- however when we heard that this season was the effective ‘Seinfeld reunion’, we started watching Curb from scratch. Just about to finish S3 and loving it. Big Seinfeld fan here, but hadn’t heard of Curb before reading this. Perhaps it has something to do with it not being aired here in the Netherlands (I think). Thanks for the heads-up, will try to get into this one. I never watched Curb, and wasn’t much of a Seinfeld viewer (I did watch the Soup Nazi though). But the comment regarding the melding of fictional realities is worth a little analysis. Star Trek XI worked as well as it did to me thanks in no small part thanks to Star Trek Generations and Spock’s last appearance on the Unification two part episode from TNG. Abrams openly acknowledges the old universe’s relevance while blazing this new path. Kirk’s death made his younger self’s reunion with Nimoy’s Spock all the more poignant. Leonard Nimoy’s Spock is a highly evolved complete character, carrying 90 years of baggage, since Kirk’s “demise” on the Enterprise-B, and the death of Sarek. Having him meet a younger Kirk, and encourage a friendship with his younger self is as close as a vulcan can get to resurrect a human friend (in contrast to Kirk’s actions on the third film). Love both Seinfeld & Curb (&TDS/TCR btw). Surprising how Seinfeld, after all these years remains funny and fresh. Everything else I watched and loved then has faded – after watching BSG I just can’t get myself to watch Trek reruns. XI had to reboot or fail. Big Seinfeld and Curb fan, not to mention a huge fan of Trek and BSG. I thought season 7 of Curb was fantastic, and if Larry David ends up hanging it up for Curb, I say bravo for giving Seinfeld fans a new (and superior) ending, as well as a creative send-off for Curb. ZL: Funny, I just was watching TNG and DS9 reruns in the last couple of weeks which I haven’t seen in over a decade. Compared to BSG, they remind me of comic books (still, incredibly GOOD comic books at that!). As for Voyager, if the others are comic books, let’s just say Voy is an ages 3 and up coloring book! 😉 And Enterprise? As painful as reading an instruction manual on programming an 80’s VCR heh. It is truly a nice and helpful piece of information. I’m satisfied that you shared this useful info with us. Please stay us informed like this. Thank you for sharing.